There are now many schools of AcroYoga or partner acrobatics. One such school was founded by Jason Nemer & Jenny Sauer-Kline, formally based in San Francisco, California. The word AcroYoga comes from the Greek root word akros meaning high and Sanskrit word yoga meaning union; so together AcroYoga means high union. massage & metta (loving-kindness) healing. Unlike other forms of yoga, AcroYoga builds on the potential to connect with others, to build on community and cultivate trust within an environment of safe play. the flyer, who is either the performer or the receiver of therapeutic flying. AcroYoga combines both dynamic and therapeutic sequences that range from massage and therapy to performance acrobatics and dance. Practitioners can follow set flows to the point they become familiar with the practice and can then work on improvisation. 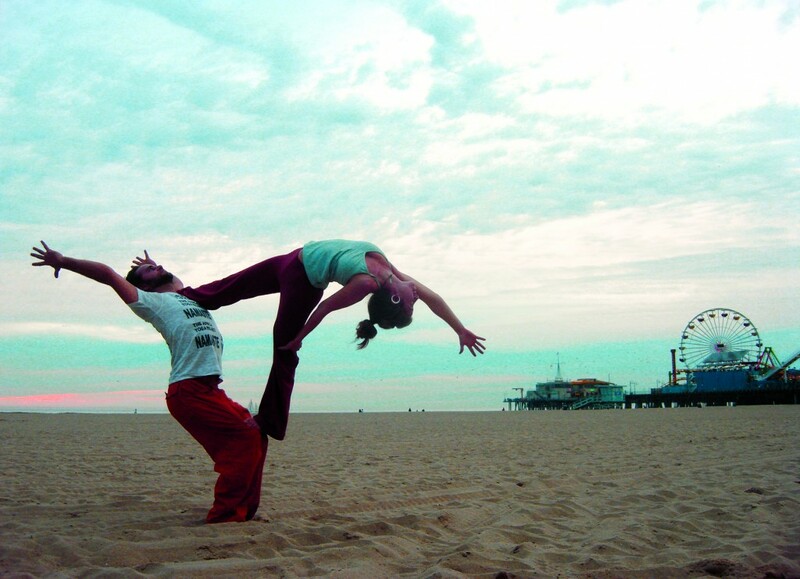 AcroYoga actively encourages inversions in particular handstands. BREATH, when conducting challenging skills or sequences the tendency is to hold the breath. Happy to work with a partner or in groups of three or more, there will be no need to bring a partner, we’ll pair you up.